The Missive Maven: Hot postcards! I had a lot of fun picking postcards for the Hot postcards swap on swap-bot. I do love me a good pin-up and a little bit of sizzling salaciousness, and nothing was better for this swap than postcards from the fabulous Hellcat Amazons postcard book. 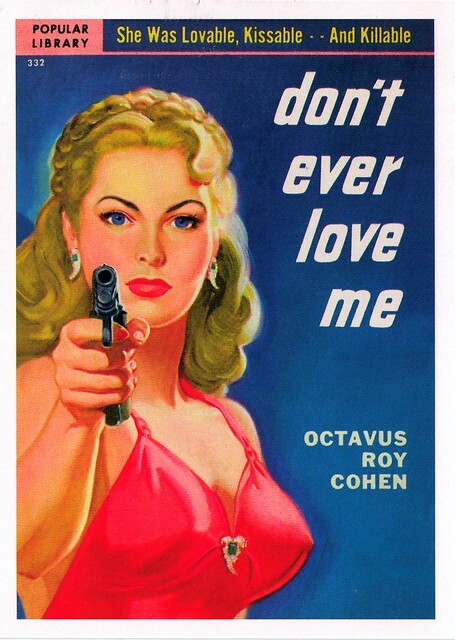 I'm a big fan of the campy-ness of these classic pulp images. This one promises to be "revealing." Ha! I received one of my two postcards for this swap yesterday, and it's a bit too risque for me to post it here! This swap was a play on hot weather/hot postcards, but I do believe the summer is gone. Labor day is past, and it certainly seems like fall here now. Wow--these are fun, Missive Maven. We in San Francisco are finally getting our "summer" after a cool, foggy, chilly summer. September is when we finally manage to get over 65" -- but it's not as hot as these postcards. Looks like a fun swap. I was actually the receiver of one of these cards and I LOVE it. The card has proudly entered my library on my wall of vintage/pinups!